In January I participated in a #PKMChat Twitter chat on Personal Knowledge Management (PKM) Routines. After the chat I considered my mixed progress against the goals I had set 9 months previously, and observed that I didn’t have a routine. This prompted me to document me a weekly routine incorporating some of the tips from the chat. I tracked my habits using the Way Of Life app to gather data so I could refine my routine. After two weeks of data gathering I also reviewed my professional network and set goals for the coming year which will help me to purposefully and consciously develop my network. I realised that in the past year most of my network development had occurred as a result of my online PKM activities. However, there are other activities required to achieve my networking goals. 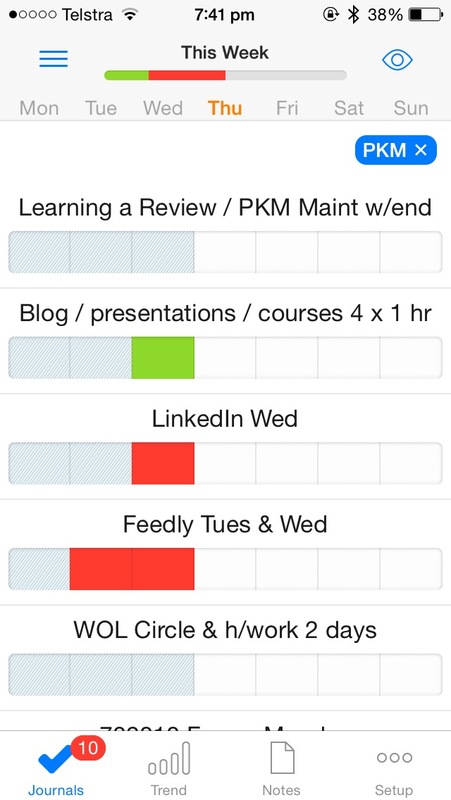 I updated my weekly routine to incorporate both PKM and focussed Networking activities. You can review the complete routine at this link. While it looks like a heavy investment of time every week 5 hours is time I am sitting on public transport and many of my daytime activities are integrated with my work. This reduces the ‘extra’ time that I am investing in sense-making, content development and network maintenance – activities which I find require longer, quiet periods of concentration. Each quarter I shall review progress against my PKM & Networking goals, and analyse my network. This will be an iterative activity which shall build upon my weekly networking maintenance and allow me to fine tune my routines and specific focus areas. Are there other PKM or networking activities that you perform regularly? Please share by replying to this post. This entry was posted on February 9, 2015, 6:43 pm and is filed under Networking, PKM, SLPP. You can follow any responses to this entry through RSS 2.0. You can leave a response, or trackback from your own site. I think it’s the musician in me, but I tend to have more of a syncopated rhythm than a routine. Many of the tools and processes that you’ve listed are ones that I use, but I don’t do them on a set timeframe rather, moving between them as my work, available time, tiredness levels, interest and mood lead me. It’s a bit of an intuitive process, but over an extended time there are rhythms to it, with some that get returned to regularly and others only occasionally. I do write an annual plan (and yes, old school I write/sketchnote it). That’s for me the most helpful thing I do. It’s interesting that you observe rhythms over an extended time Neil. The value of the annual plan is also interesting – I think something like an annual plan helps provide direction for when time is available for PKM and networking activities. At the time I wrote this post I was in full-time employment and had a very useful block of daily time during my public transport commute for PKM and online networking activities. Since returning to working for myself last October my routine is a thing of the past. I really miss it and am yet to figure out a new routine or rhythm that works for me in my new work / life context. Here’s a working out loud opportunity for me. I recommend an excellent Twitter chat directory, always up-to-date at https://chatdir.kneaver.com . It’s maintained by Bruno Winck, host of #PKMChat. A cool feature is that it displays chat times in local time. A critical feature is you want to place them in routines and if you don’t live in the same timezone (or hemisphere). Well-shared Bruno = thanks for a great resource.